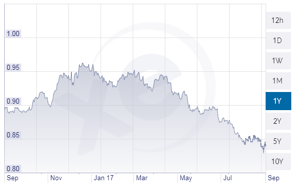 The decline in sterling/ Euro to £/€1.08 over August suggests concerns over the “Brexit” talks and a higher risk of “hard” Brexit where the UK crashes out of the EU without a deal. The talks are not going well with the EU’s negotiator Michel Barnier claiming the UK was “suffering from nostalgia, making key requests that amounted to getting the benefit of the EU single market without being part of it”. Importantly Mr Barnier claimed that the UK’s plan to have EU standards cut and pasted into UK law and then be automatically recognized by the EU were impossible, as they lacked the EU’s supervising and enforcement. He said that the UK’s attempts to start talking to EU countries directly going over the head of the commission would fail. A Recruitment & Employment Confederation Survey (23rd August) found 31% of employers expecting the UK economy to worsen, and urged the UK government to give greater clarity over Brexit. 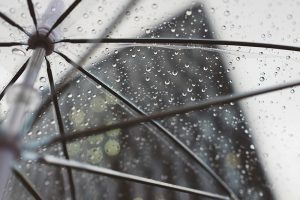 Provident Financial’s CEO Peter Crook left after admitting a sharp deterioration in the collection rate to 57% post the move to an online platform. The dividend has been cancelled amidst concerns over the balance sheet. Dixons Carphone revised its profits down by £80m contradicting its bullishness in June. Whilst one factor is the delay to mobile phone upgrades, the lurking suspicion is UK customer habits have changed reducing footfall and demand. China’s official factory gauge strengthened further in August – the PMI Index rose to 51.7 from 51.4 – its fastest pace since April 2016. Steel futures prices jumped 9% over August adding to year to date gains of c. 50%, another strong indicator of Chinese construction growth. 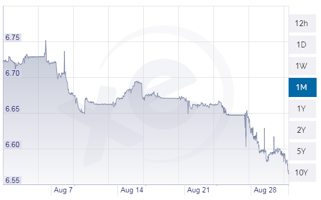 The Chinese Yuan appreciated sharply over August v USD. The North Korean situation is assumed can be solved via diplomacy, but the risk of a military confrontation cannot be discounted. It has become clear that North Korea is developing improved ballistics that could carry nuclear missiles. Is the world ready to take the risk of Kim Jon-Un holding a nuclear arsenal with first strike capability? This is a problem that will have to be addressed. German GDP in Q2 accelerated to 0.6% its fastest growth rate since 2014. The positive economy is a big help for Chancellor Angela Merkel ahead of September 24th Federal elections. Polls suggest Merkel holds a 16% lead over rival Martin Schulz. The German auto industry is suffering from its very high exposure to diesel. Both France and the UK have moved to ban petrol and diesel from 2040. The US auto industry (Tesla) and others (Volvo/ Geely) are anticipating consumer demand shifting to electric/ hybrid vehicles and moving away from diesel. In some EU countries demand for diesel is down 20%-25% in 2017 ahead of Euro 6 (a new cleaner diesel technology). VW has launched a new scrappage scheme offering discounts of £1800 – £6000 to buyers who trade in their old diesel models. The Euro maintains upward momentum v USD. US President Donald Trump’s rather stupid remarks in relation to the Charlottesville protestors is the latest in a series of mis-steps leading to a loss of Congressional support and amongst key business leaders. A lot of uncertainty exists on the delivery of the Trump legislative agenda. It is said Donald Trump and Mitch McConnell have not talked for many weeks. Hurricane Harvey should cost less in insurance claims than either Katrina ($75bn) in 2005 or Sandy ($30bn) in 2012. The extensive flooding of Houston has so far led to closure of refining capacity and spikes in petrol prices. Insured losses could be $1.2bn – $2.3bn according to Air Worldwide, a provider of catastrophe risk modeling software. Footing the bill for Houston is the familiar gamut of global reinsurers, Munich Re, Swiss Re and AIG. Campbell Soup warned that 2018 sales are likely to fall due to changing customer preferences and shopping habits. Adjusted Q2 EPS of 52 cents missed forecasts of 55 cents whilst sales were $1.66bn. The shares closed at $46.20 down 8.11%. The S&P 500 was flat over August (+0.05%) not surprising given the market rating, currently 24.6x against a median P/E of 14.6x since records began. The broad blue chip index has shown signs of “tiredness” recently as investors have become weary due to concerns about the White House agenda.